Bibliographic Information: Raud, Piret. Härra Linnu lugu. Tallinn: Tammerraamat, 2009. Raud, Piret. 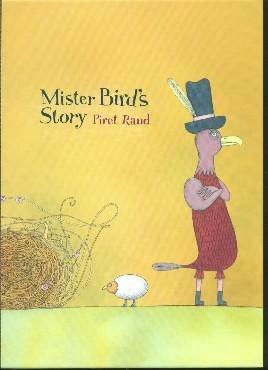 Mister Bird’s Story. Tallinn: Tammerraamat, 2009. Mister Bird didn’t care about ordinary activities like nest building and singing. He wanted to know what it feels like to be something else. He tried to live as a pillow, a hedgehog, a snowman, a carrot, a hare, a fox... until he met Miss Birdie. Suddenly singing in the choir seemed extremely exciting, and Mister Bird even excels as a conductor. He might be happy having a nest with Miss Birdie. The book develops children’s imagination and skills in regards to interpreting pictures. Tolerance towards different behaviour and characters as an important quality of social relations is pointed out. At the same time, the story reflects on the very old tradition of song festivals known not only in Estonia but also in Latvia, Lithuania, Germany and other European countries.